We are all guilty of being in a rush, especially early in the morning. We are trying to get to where we are going and then of course, all of a sudden the traffic light turns red. At this point, it’s time to make a decision; either come to a revolting stop, slamming on the brakes throwing our coffee into our laps or step on the gas pedal just a little and speed through it. All too often I find myself stepping on that gas pedal and pretending not to have seen the light turning red. I’ve never really considered why though until now. Why is it so easy for me to disregard something so serious? I mean, what if that traffic light turned red specifically for me to slow down? I know it all seems kind of deep, especially if we are just talking about traffic lights, but if you haven’t noticed, we are talking about something way bigger than a traffic light. I have a strong belief that life places things strategically in our way for a purpose; there are no accidents. Everything happens for a reason and I feel that maybe, just maybe, if we get that moment in life, where we just want to blow through the light, we should think twice about it. After all, red lights were made to tell us to stop. So, on a deeper level, stop running red lights! When a red flag pops up in your life, whether it is in your relationship or at your job, instead of pushing through it, slow down and actually notice it. Maybe there is something more to it that you are not seeing. Maybe it is serving as a sign. Maybe that little hiccup that you don’t have time to deal with is actually trying to tell you something that you need to know or show you something that you need to see. Whatever the case, just remember that red means stop. 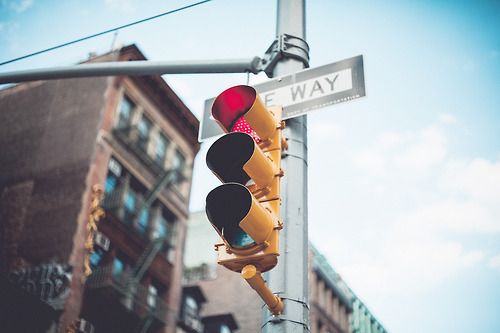 Simply what I’m asking is that the next time something pops up in your life, and you feel like it is as annoying as that traffic light that turns red just when you had somewhere to be five minutes ago, don’t disregard it. Often, all the answers that we are looking for are right in front of our eyes. We are the ones that complicate things by not paying attention. For if we make the conscious choice to pay attention to things that are trying to get us to slow down or stop, we may end up finding a new road to take. We only get one shot in this life and we should be nothing but happy, every day. I know how hard that is and of course, it’s easier said than done. But, it’s worth it. To make a conscious decision every day to slow down and be happy; to accept the here and now and be satisfied; to remember every time we are involved in a negative conflict that tomorrow may not come; those choices have the ability to make a huge difference in the outcome of our life. The most important thing you can do, for you, is to be aware of everything around you, really be there in the moment every day and don’t fall victim to letting the small moments slip away. I am not saying that you shouldn’t reach for more. What I am saying is that along your journey in this life you must not let the small things slip away all because you feel the need to run that red light.